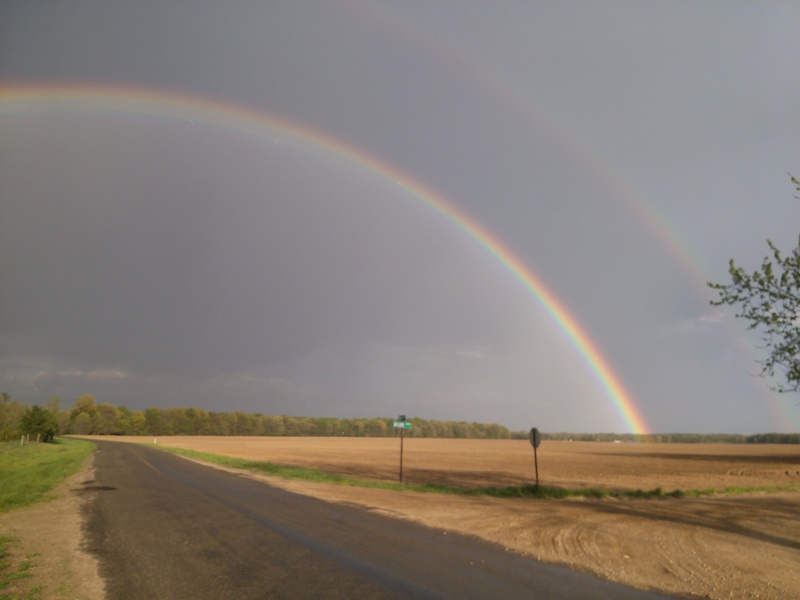 We were treated to this spectacular double rainbow this evening! This was one of the best we have seen in years and amazingly we could see the “rain line” where it was dark on the side we were on and sunny on the far side of the rainbow. You can sort of see that in the photos. It was far too large to get a photo of the whole thing, but it sure looked like there might be a pot of gold at either end, both sides of which appeared to touch the earth! Nature photos rarely do justice to the majesty that we see in real time and that is definitely the case here. Lots of folks find religious and spiritual influences in feats of nature like this. Others, like myself, see the scientific side of water refracting light. Regardless, its experiences like these that prove to me how small we really are in the big picture of our world and our universe. I had the opportunity to experience this with my daughter as we chased it around and tried to find the best position to get a photo before it faded into obscurity. That is all the spirituality I need! A fascinating world we live in sometimes! I love double rainbows! We see them pretty often out here since we live in the land of wide open vistas! When Danny proposed in Aspen we drove through Glenwood Canyon and saw double rainbows. It must have been a sign since we have been married for 25 years! Really cool rainbow and the idea of chasing it with your daughter is nicer.. 🙂 First time I heard Roadkill Stew. I enjoyed it. Chuckled all the way through. Stunning – and wonderful that you were able to share this magical moment with your daughter. 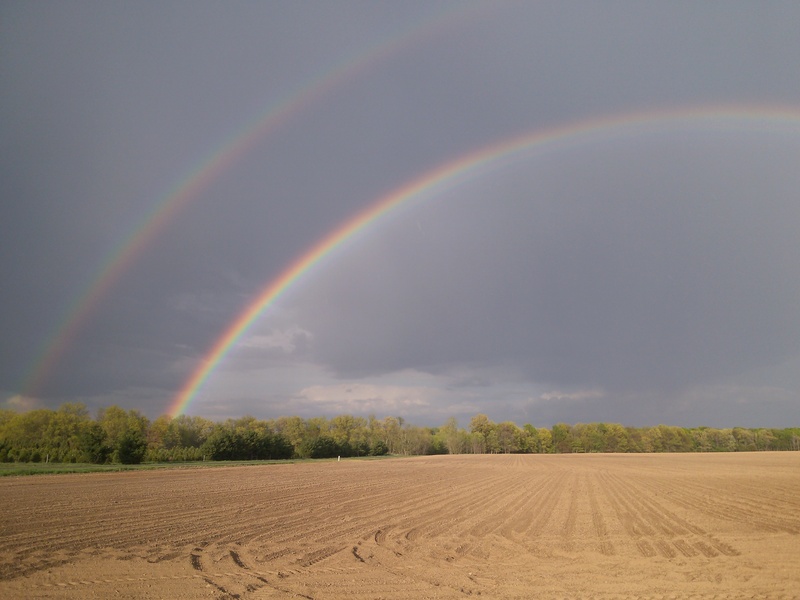 We see double rainbows too… Not this year yet!!! Beautiful!! Love this. I am sure there was gold there on one side or the other. Maybe you just were going after the wrong end of the rainbow. Beautiful images. It’s rare that we can see one here where both ends touch the ground. It’s magical. 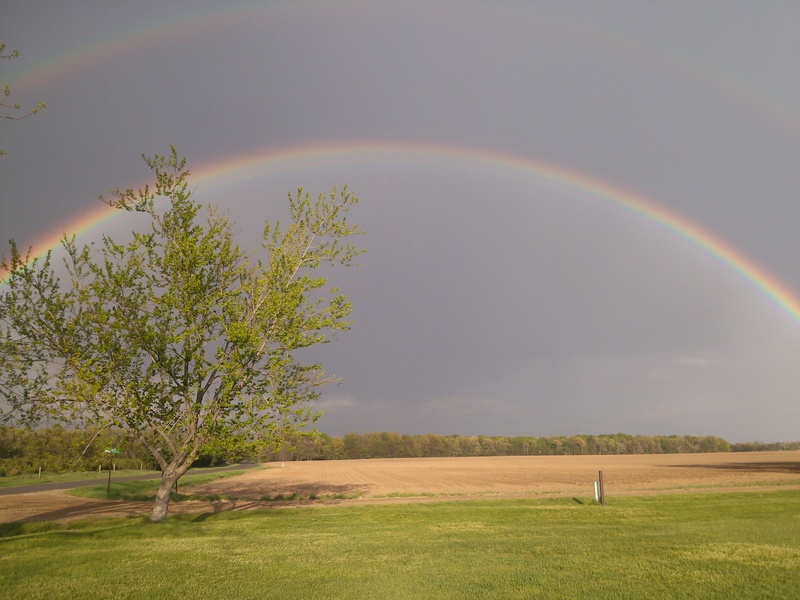 We had a most awesome, very wide, double rainbow this morning. Just beautiful. How great that you got to share this experience with your daughter. I used to love watching storms roll in with my dad. Exceptional double rainbow shots. What a terrific image. Thank you so much for sharing it. I’ve been staring at office walls and a computer screen under fluorescent lighting for far too long. I truly appreciated living vicariously through your double rainbow. <— That's a sentence I would not have predicted typing today! Wonderful post … I have experience two rainbows too – outside Seattle when we passed all the islands in Puget Sound. It was truly a magical experience. Lovely gallery. Gorgeous photos and an even better image of you and your daughter running around together enjoying this breathtaking sight. Happy. Good work, papa! And what a metaphor, chasing rainbows… Truly amazing photos because I’ve seen rainbows like this and understand exactly what you mean trying to capture them on film. I’ve only seen two perfect rainbows once. I’ve only seen a truly red sky once. I saw them both at the same time. It literally sent shivers down my spine as the sky changed colors. I didn’t see religion or science, though. I saw a once in a lifetime moment. Pretty pictures, Steve!